Quincy, Mass. -- One year after leading Wellesley to a Division 1 State final, Henry Weycker seems to be doing it all over again. On Wednesday afternoon, Weycker threw a complete game allowing three earned runs on five hits while also drilling the game-winning two run triple as No. 3 Wellesley defeated seventh seed Xaverian, 7-4, at Adams Field. Wellesley advances to the Div. 1 South Sectional Final on Saturday afternoon. Weycker finished 2-for-4 at the plate with three RBIs. On the mound, the left-hander was in ace form for most of his outing hovering between 85 and 86 miles per hour while showcasing a sharp curveball. The Raiders (19-5) led 3-2 after five, but saw Xaverian score a pair highlighted by a go-ahead RBI single off the bat of Sean Birch that put the Hawks ahead 4-3 heading into the bottom of the sixth. Colin Blasco and Tommy Lieberman singled around a dropped ball at first base loading the bases with nobody out. Hawks’ starter Owen Langan followed by inducing a soft line drive to shortstop. The liner was dropped by Xaverian shortstop Jake Cassidy, but with the runners having to freeze Cassidy was able to turn it into a 6-2-5 double play to put Langan on the verge of getting out of trouble. Now with two on and two out, Matt Maiona hit a line drive that seemed to be the third out of the inning. The ball, however, skipped off the glove of Kyle Sylvester and into right field bringing home Lieberman to tie the game at four. That set the stage for Weycker who drilled an 0-1 curveball to dead center field for a two run triple to put Wellesley in front, 6-4. The Raiders added insurance moments later as Kai Grocki lined a single to left to give Wellesley a 7-4 lead. 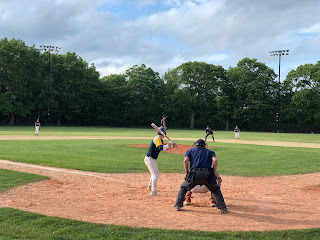 In the top of the seventh, Patrick Manning led off with a base hit but Weycker generated a 1-4-3 double play and got a pop up to third base to finish off the complete game. Wellesley jumped on top in the bottom of the first as John Ciolfi doubled and Weycker lined an RBI single to right to give the Raiders a 1-0 lead. One inning later Wellesley doubled its lead. Lieberman singled, moved to second on a wild pitch, and came home to score on Ciolfi’s second double to make it 2-0 Wellesley. Weycker cruised through the first two innings, but Xaverian got to the Virginia Tech commit in the third. Matt Joyce singled, was sacrificed to second and then stole third. Weycker came back and got a strikeout for the second out of the inning, but a Chris Ducko ground ball was bobbled, bringing home Joyce and trimming the Wellesley lead to 2-1. One inning later the Hawks’ tied the score as Jack Whorf led off with a singled and came around to score on a Charlie Bean sacrifice fly to even the game at two.